The British Grotowski Project – a re-evaluation’ has received significant financial support from the Arts and Humanities Research Council. The project, under the direction of Professor Paul Allain, will be run with the assistance of the Grotowski Institute in Wroclaw (Poland) as well as other overseas partners. 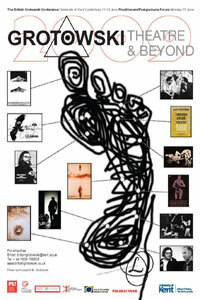 a Critical Edition with an accompanying DVD of images, film and audio extracts. a multi-modal international conference for practitioners and academics in 2009, the 'Year of Grotowski' (marking the 10th anniversary of his death). For information on Paul's short article on 2009 activities in Theatre in Poland go here For the full text go to Texts. 2009 is the UNESCO-designated ‘Year of Grotowski’ commemorating the 10th anniversary of Jerzy Grotowski’s death, celebrating the 50th anniversary of the Teatr Laboratorium’s foundation, and recognising Grotowski’s enduring influence upon theatre and performance practice. We are pleased to receive a grant of up to £2,670 by the Art Council England (South East) towards the visit to Canterbury in May 2008 of the Milon Mela Company from India. 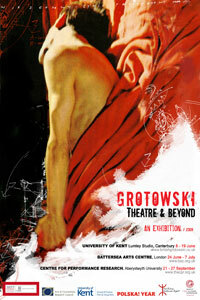 We are delighted to announce that Jennifer Kumiega's Theatre of Grotowski is at last once again available as print on demand.